Plastilin added a comment to T138818: BattlEye initialization failed. could you please try it in 1.92 RC branch? We have few official servers online so please try if you are able to connect in the new version. Beta code is Arma3Update192RC. "A" server - BattlEye initialization failed. "B"&"C" servers - works fine. It might not work but try uninstalling BattlEye and reinstall it again on your system. "Tried everything" means - tried everything. @Plastilin Maybe I'm wrong. But when BattlEye is removed, BattlEye user folders remain on the system disk. After deleting BattlEye, Use the search on the system disk, find all the folders named BattlEye. Delete these folders. If deleting folders encounters a failure to delete, in the task manager, find the BE processes and close them. Continue deleting the BattlEye folders. Reboot the PC. Install BattlEye. This problem could occur when Arma3 or DayZ was updated, but some of them launched the old version of BattlEye. Lex added a comment to T138818: BattlEye initialization failed. Astaroth closed T138790: T192827-Arma 3 crashing whenever i load into a game singleplayer or multiplayer as Resolved. glad to hear. Thx for info. Astaroth added a comment to T138791: Battleye not working therefore not letting play arma 3. Astaroth added a comment to T138818: BattlEye initialization failed. could you please try it in 1.92 RC branch? We have few official server online so please try if you are able to connect in the new version. Beta code is Arma3Update192RC. Astaroth added a comment to T138853: Crash on Warlords official server. crashdump wasn't created. Just rpt files and they are without some useful info. Could you please attach new dumps if this issue appears again? Thank you. Lmab added a comment to T126505: Advanced Flight Model rotational motion stuttering for passengers. Happens in all aircraft as far as I can tell, just more noticeable when on a door gun. • elijahwilliam added a comment to T77511: Terrain Builder causes random slowdowns and eventually freezes PC. kristiryan added a comment to T127940: Vehicles missing hit able crew. Lex updated subscribers of T82570: UAV Darter waypoints do not always work. Jean_Lapin edited Additional Information on T138853: Crash on Warlords official server. Jean_Lapin updated the task description for T138853: Crash on Warlords official server. Jean_Lapin created T138853: Crash on Warlords official server. bnt133 added a comment to T138831: Vehicles accelerates and pulls left or right. . I apologize, I meant to add in the fact that I have "Vehicle Freelook" Enabled so I do not steer with my mouse at all. @Geez My ticket was closed - as "no problem" or "this is according to the scenario." But you do not solve the problem of moving the darter to the control point. As a result, we have a non-working darter, we have the opportunity to stop the rotation in offline mode, but we lose control of the camera. What happens and when this ticket will find the attention and solution? KGF123 added a comment to T127541: Bad Module Info crash whenever I drive. Discussed how do i reset my wireless displays connections in windows 10,that is very simple to find solve this issue,just click here this url link fix connections for bluetooth audio devices and wireless displays in windows 10 you are not alone here,many users facing this same issue. KGF123 added a comment to T119063: D3D Error - DXGI_ERROR_DEVICE_REMOVED. This is amazing addition online video free game,no download and charges required mahjongg connect free you can easily to play with out any internet connection,so finally try to played. Lex updated subscribers of T127310: [1.78-DEV control keys] Command Commands for the AI ​​driver of the vehicle..
Lex added a comment to T127310: [1.78-DEV control keys] Command Commands for the AI ​​driver of the vehicle.. I don't know what you guys did? I checked it today in DEV 1.93.145618. Control of the tank - I lost the ability to order for continuous movement, for the driver of the crew. Vitdom added a comment to T138818: BattlEye initialization failed. Vitdom added a comment to T138831: Vehicles accelerates and pulls left or right. . Sounds like something is wrong with your mouse. Which version of Windows 10 are you using? Ctrl+R "eventvwr", OK then write down the version and build numbers. bnt133 created T138831: Vehicles accelerates and pulls left or right. .
Vossakurwa added a comment to T79675: Add a "Mute All" option to the player list.. I would love this feature too. To be able to toggle to mute all players with a keybind, in those moments when you need to listen for footsteps and everybody is going off on side chat. Lex added a comment to T127272: BUG Zafir optics. I checked it today in DEV 1.93.145618. Two optical sights corrected - ERCO and MRCO. 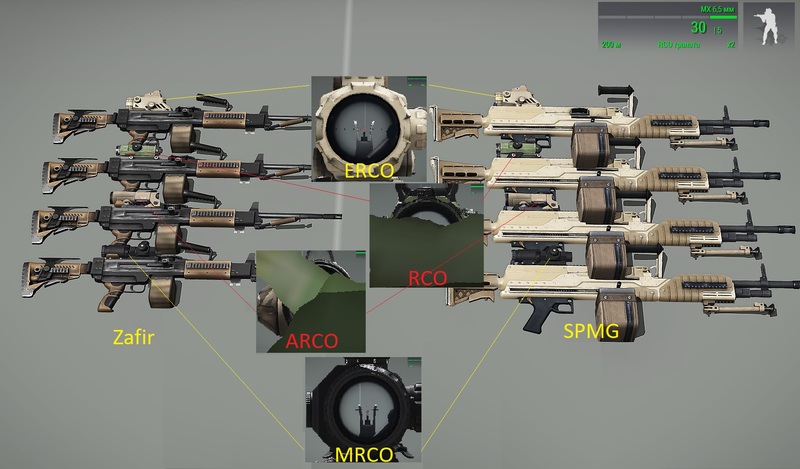 Two riflescopes are hidden in the Gili texture - the RCO and ARCO. Lex added a comment to T83081: PIP + Quality of PIP and influence on productivity of system. The landscape in the PIP window does not influence FPS..
@razazel Thank. I checked it today in DEV 1.93.145618. Now the range of viewing the image in PIP in a direct distance of about 2000m, before the fog appears in the PIP window. But this is still not the full viewing distance from the camera. As I wrote earlier, the decrease in FPS does not depend on the viewing distance in the PIP window. FPS size does not change for any viewing distance in the PIP window. Even when there is only fog in the PIP window, the size of the FPS will not have a magnitude higher, it will not change. I'll add a video in which even opening a second PIP window does not unbalance FPS. If the FPS has a stable value, why not make a preview in the PIP window for the whole distance, the distance available in the game \ mission settings? G.Ho added a comment to T138714: MP Server Zeus Freeze Crash. I will have a look for it next week. Shields added a comment to T82251: Vehicle Inventory issues..
Vitdom added a comment to T138791: Battleye not working therefore not letting play arma 3. Try and validate your game files through Steam>DayZ>Properties>Local Files>Verify Integrity of Game Files. Then uninstall BattlEye and reinstall it again on your system. Vitdom added a comment to T138714: MP Server Zeus Freeze Crash. "a flash of black screen" usually mean something is wrong with the graphics driver. You can try and update your graphics driver. Also, Windows almost always logs an error when this occurs, look up the details in the Windows Event Viewer? Lex added a comment to T78993: AV camera viewdistance is always 500 whatever the player viewdistance. @thanos17997 What did you want to offer, I did not understand why the link to the OS panel? aadilkhan9409 added a comment to T70855: Adding a Single Line Comments stops all commands after comment from executing. I am here for the share this great fun to join http://robloxfreerobuxgenerator.com this is the best way for the join this tiles game. aadilkhan9409 added a comment to T85620: Keeps on crashing!. Wonderful article about dvd player you have posted complete detail which i like reading http://dvdplayerwindows10.com just use the dvd player and sharing with your friends. aadilkhan9409 added a comment to T66330: One line comments sometimes block the read of the file..
Plastilin changed Operating System Version from 17763 to 1.90.145471 on T138818: BattlEye initialization failed. Plastilin created T138818: BattlEye initialization failed. JB47394 added a comment to T138803: player selectionPosition "leftleg" returns incorrect position. And now it's working correctly. Same code, same game session, but the knee baseball now shows up where it should. JB47394 created T138803: player selectionPosition "leftleg" returns incorrect position. L0cke_ added a comment to T138790: T192827-Arma 3 crashing whenever i load into a game singleplayer or multiplayer . Lex added a comment to T127072: The way the marker is set affects its binding to the terrain..
@Wulf Thank you for correcting this ticket. I checked it today in DEV 1.93.145618. Close this ticket. Lex updated the task description for T127072: The way the marker is set affects its binding to the terrain..
Lex added a comment to T127626: [Tanks DLC] AI the driver doesn't keep the Tank position. For AI there is no dumping of the appointed traveling point.. I checked it today in DEV 1.93.145618. No fix. The last waypoint is saved and always appears for the driver of the car. zekunmeng2016 added a comment to T136490: Access Violation. Thank you for the report. Is the crash random or does it happen when you do soemthing specific? • thanos17997 added a comment to T71114: AI-controlled sniper team unable to engage from bigger distance.